Everyone is talking about the inspiring speech at Madison square garden yesterday! If you have not seen the speech till now then do watch it now! It was very inspiring. People are saying that yesterday’s speech at Madison square garden was outstanding, rare, and full of vision. It was something which we have never heard before and his speech touched everyone. Moreover, the crowd over Madison square garden was cheering him on his every sentence. NRIs were so happy and he also invited NRIs to come to India and fall in love with your motherland. He said “I am going to make an India of your dreams”. 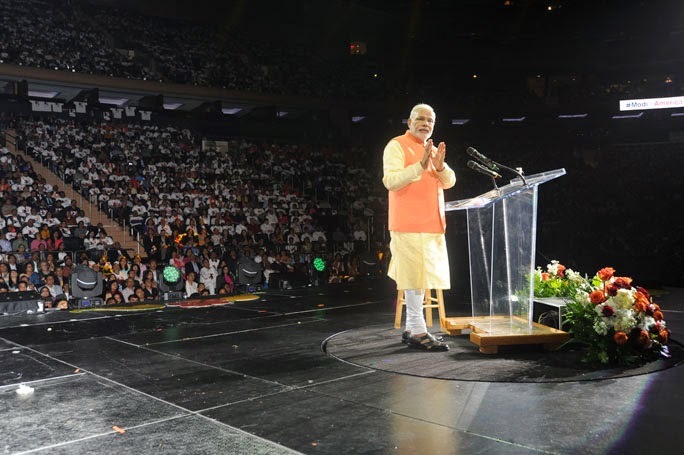 He urged the Indian American community to join the development effort for India. In addition, NRIs gave a great response to that. Prime Minister Narendra modi highlighted the unique combination of three great strengths that India has and they are “Democracy, Demography, and Demand”. He said that democracy is not just a system of governance but an article of confidence as well. He said that winning the election is a great responsibility and he will do his best to make India well developed country. He added that now India has the capability, possibility, and opportunity to make the 21st century India’s century. In addition, he said that India is both the youngest nation and oldest civilization on the earth. Narendra modi ji added that PIO (Person of Indian Origin) cardholders will be granted VISA for lifetime and new scheme will be declared soon, merging two schemes PIO and OCI (Overseas Citizens of India).